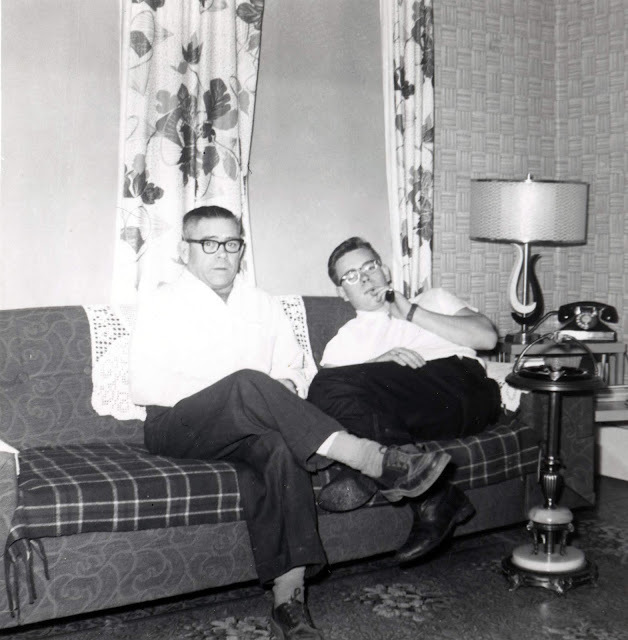 Here's a shot of Dad (right) and Granddad (left) in 1959. Dad would have been 17 in this shot. I believe this would have been in Aylsham, Saskatchewan, but it could also have been Dauphin, Manitoba. Note Dad's pipe. Dad's father died young, at 54, and I believe he only met Mom once. You could tell that the loss deeply affected Dad, who I remember told me once that his father sometimes, as a ghostly vision or a dream, would come sit on the bed in the darkest hours of the night and ask Dad how he was doing. You could tell that Dad found these visits comforting. While I'm not a spiritual person, I honestly hope they're together now, maybe playing crokinole.